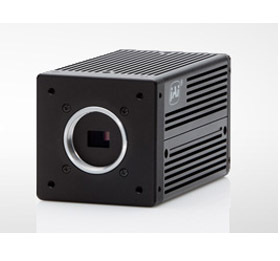 The AD-132GE utilizes JAI’s 2CCD prism technology to provide 1.3 megapixel resolution for high dynamic range color imaging applications. Two 1/3″ color CCD sensors (ICX447AK) with sensitivity in the visible spectrum are aligned to within one-quarter pixel accuracy. By altering the shutter/gain settings of the two CCDs and fusing the two synchronized video streams, the AD-132GE can provide more than double the dynamic range of standard CCD cameras (up to ~120 dB) but in a linear fashion that avoids the noise, shutter, and compression issues found in typical CMOS-based logarithmic or LinLog™ high dynamic range cameras. The AD-132GE is equipped with a variety of trigger modes including a special 3-shot PIV (Particle Image Velocimetry) mode (download PIV technical note for more details).